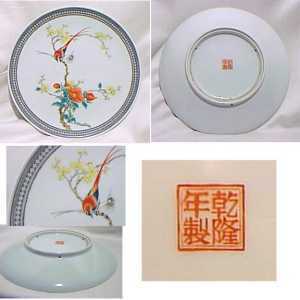 Hot Water Plates, with birds and flowers? I have four plates with birds and flowers. 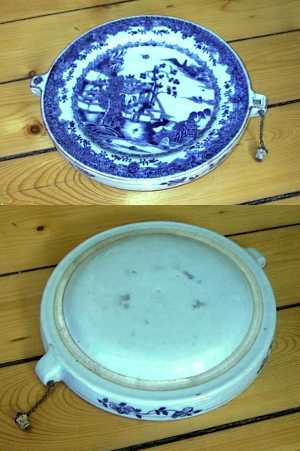 The plate itself is heavy ironstone 3 lbs. each, the mark looks to be from Japan. I was told that these might be Hot Water Plates. They have a base that looks like it would sit on something. If you can add any information on the use and age it will be most helpful. Regarding you plate, I would say it is more or less new. It is made in China and the mark is a type of "Qianlong" seal mark that came into use in the early 20th century when they did not really know what mark to use. If it is a hot water plate or not I don't know. Is it hollow? Otherwise my best guess is that they are decorative serving dishes with the holes in the base added to simplify wall hanging.